The Dragon Ball Z Awakening set includes more than 140 exclusive cards, including two powerful Ultra Rare cards. Gohan transforms into Super Saiyan 2, bringing a new pinnacle of power to the DBZ universe. Each starter deck contains 70 cards (a 60-card deck, 4 parallels, and 6 Prizm technology cards - 4 Personality cards, a Mastery, and a random parallel). 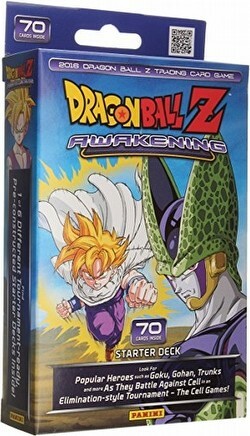 Look for popular characters such as Gohan, Goku, Trunks, and more as they battle against Cell.